52 Weekly Prizes: 45,000 Wyndham Reward Points worth $585.00. 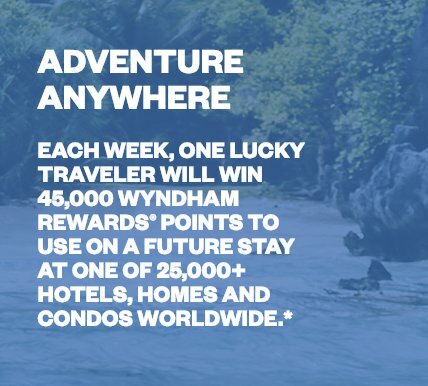 Register, and come back daily to earn entries for a chance to win 1 of 52 keys to adventure – 45,000 Wyndham Rewards Points to use on a future stay at one of 25,000+ hotels, homes and condos worldwide. 45,000 Wyndham Reward Points worth $585.00.